For good reason, Chaplin’s bitterness towards the United States was very high during the late 1950s. His persecution under the Red scare and constant tailings and pressure from the FBI resulted in Chaplin being exiled in 1952. Along with the forced sale of his personal assets, Chaplin also lost his beloved studio, Chaplin Studios, which was located at the corner of La Brea and and Sunset Boulevard in Los Angeles. For over 30 years, Chaplin had the convenience of working at his own studio, with crew members who were familiar with his work and style and, most importantly, on his own time. In Europe, once Chaplin decided to move forward with another film, which, at first was a slight consideration of returning to Shadow and Substance, but later settling on A King in New York, Chaplin had to rent a studio in which to shoot which greatly hindered his normal process. 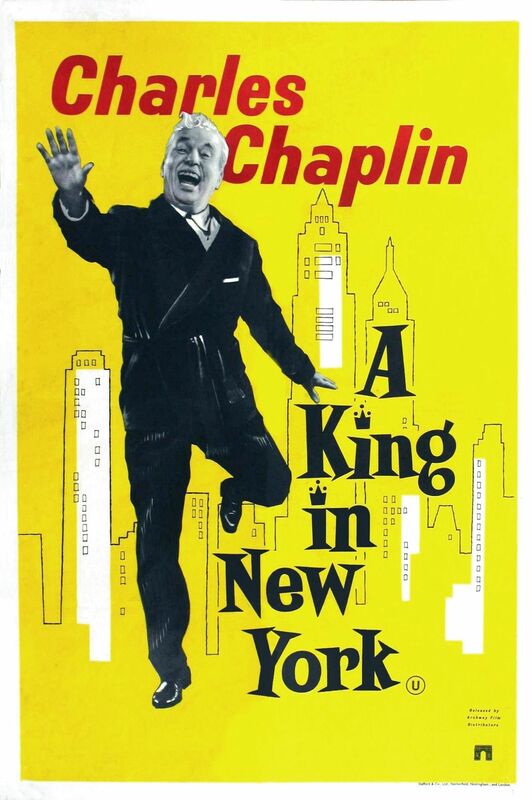 A King in New York was Chaplin’s return parry at the United States government. The story centers around Chaplin’s character of King Igor Shahdov, a recently exiled king from a small, unnamed European country. For reasons unknown, his prime minister has drained the country treasury and disappeared, leaving the king stranded and broke in New York City. Trying to the make the best of his situation, Shahdov tries to present an appeal towards the peaceful use of nuclear power, in addition to settling into life in America in the 1950s. Chaplin satirically takes jabs at much of American popular culture of this era including wide screen movies, rock and roll music and cosmetic surgery, among other things. One night at a dinner party, which is unknowingly being broadcasted live on television, Shahdov alludes to the fact that he has had some theatre experience. Because of this, he is eventually conned by young, pretty T.V. Specialist Ann Kay (Dawn Addams) into doing a deodorant commercial, which is filmed secretly and without his consent. The commercial becomes a success and the king is offered many other opportunities for doing commercials and plugging various products. At first he rejects all the offers, but, eventually, because of the need for money, ultimately accepts. Soon after his newfound commercial successes, Chaplin runs into a small boy named Rupert (played by Chaplin’s older son with Oona, then 10-year-old Michael Chaplin), whose parents are about to be jailed for communist sympathies by the House of Un-American Activities. Shahdov gives Rupert refuge in his hotel room, causing himself to become a suspect in communist sympathy. In the end, Shahdov is disillusioned with the United States and leaves the country. It would be 16 years before A King in New York was released to American audiences because of the obvious attacks on the country at the time; in Europe, the film received decent, but not glowing reviews. Because of Chaplin having to rent studios and work with a crew he was not accustomed (and, for that matter, one that was not accustomed to him), Chaplin rushed the production and filmed this movie in record breaking time for a Chaplin film (12 weeks). Also problematic to the production value was having to shoot London locations and in-studio sets to double for New York City. Though Chaplin said he never set out to make a political film with this motion picture, it definitely has an underlying political tone that stands out to the viewer. Furthermore, because of this, the somewhat lackluster production value and a script many say is not as generally tight as most Chaplin scripts, this film has been lamented by some audiences as not being very good. For me, personally, I enjoyed the movie. It is definitely not his best work, far from it in fact; however, it has it’s own place in his body of work and I can clearly see his reasons for making a film of this manner. My only qualms about the film were the verbose political rants given by young Rupert. To me, these became a little tiring and heavy handed, and I felt Michael’s performance was a bit stilted. Apparently, Oona and Charlie constantly went back and forth as to who was the better child actor Chaplin had worked with, young Jackie Coogan in The Kid or young Michael in this film. In my opinion, Coogan is the hands down winner of this verbal bet, but maybe Michael’s performance garners more praise than I feel due. All film criticism, after all, is subjective. The Cold War propaganda that was being pressed heavily in the late 1940s targeted Chaplin because of his liberal and humanist sensibilities. In the midst of this troubling time, Chaplin made Limelight, a film about a vaudevillian clown who has, essentially, lost his audience. Chaplin plays Calvero, a once great vaudeville clown, who has succumbed to alcoholism and an audience who no longer has interest in his performance. On coming home one night, he smells gas and breaks into a nearby apartment to find a young woman, Thereza, or “Terry” (Claire Bloom), in the midst of a suicide attempt. Calvero quickly calls a doctor and saves her life. The doctor tells Calvero that she is a ballerina who suffers from hysterical paralysis, which is paralysis present though no physical ailment is present. Calvero takes Terry to his apartment to nurse her and the two become quite good friends, offering tales of their lives and philosophies. The two genuinely begin to help each other as Calvero dreams of returning to the stage and his former glory with Terry as his companion. Also around this time, Terry begins to overcome her paralysis. As time passes and Terry’s paralysis is fully recovered, she moves up in the ballet world and reunites with a former love (played by Chaplin’s younger son from his marriage to Lita Grey, Sydney). The connection between the two for the remainder of the film is that of confidants; Terry helps Calvero try to find his former glory, and Calvero helps reinstate Terry’s confidence so her hysterical paralysis won’t attack again. 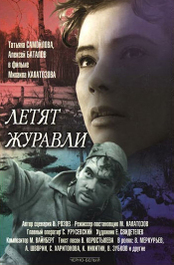 In the final part of the film, Terry arranges a final performance for Calvero where he once agains shines. Assisting him on stage is a former vaudevillian played by Buster Keaton. This is the only appearance of the two masters of comedy on screen together and is magical to watch. Following his final performance and standing ovation, the clown suffers a heart attack and dies while watching Terry dance her final act of the ballet in the limelight. This was definitely a personal film for Chaplin, as he and both of his parents were vaudevillians in England. Calvero is a mixture of several personalities that Chaplin knew growing up whose audience had abandoned them. Supposedly, before writing the screenplay for this film, Chaplin completed an unreleased novel entitled Footlights that helped him arrange the story and provided background on the characters of Calvero and Terry that weren’t shown in the film. 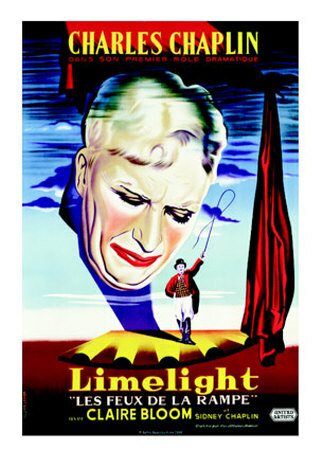 Limelight was released in 1952, the year that Chaplin left the United States in exile. He had long been a target of the House of Un-American Activities and J. Edgar Hoover kept a close watch on Chaplin beginning in the 1920s. 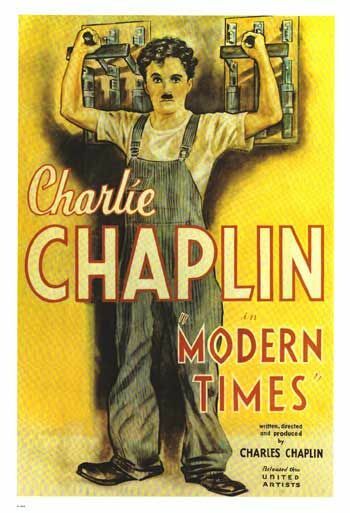 While leaving on a short voyage home to London for the premiere of this film, Hoover negotiated with the Immigration and Naturalization Service for a revocation of Chaplin’s re-entry permit (as he was still a UK citizen, though he had lived in the US at this point for 40 years). Hearing the news, Chaplin was deeply saddened and decided not to return to the United States. He eventually settled in Vevey, Switzerland, where he remained for the rest of his life. His wife, Oona, returned to the US to take care of negotiating sales of his mansion in Beverly Hills, the Studio and take care of other assets. Limelight has always been generally well-received and is a deeply moving film. In my opinion, this Chaplin’s best performance in regards to his talkie motion pictures. His sentimentality as the dried up clown and the pain in his eyes make many scenes extremely touching. There is nothing worse than watching the pain of a clown. Due to the lackluster reviews of Chaplin’s final two films, many consider Limelight to be Chapin’s true swan song. It is definitely better than his last two efforts, but I still like A King in New York a lot, which will be the next topic for this series. As an interesting side note, due to the anit-American hype surrounding Chaplin at this time, Limelight was not shown in many theaters throughout the country. A wide release was not in effect until 1972, at which time the score for this film won an Academy Award for Chaplin and his fellow composers because the film wasn’t in contention until the wide release. Because of this win, the Academy later put a statute of limitations on nominations. The Joan Barry suit plagued Chaplin through most of the early 1940s, though also during this time he met the love of his life and companion who would be with him until he passed in 1977, Eugene O’ Neill’s young daughter, Oona. 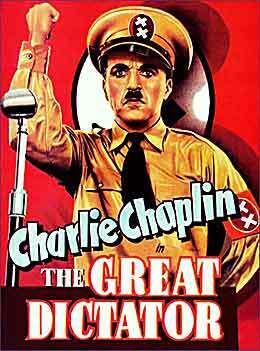 Professionally, following The Great Dictator, Chaplin began work on several different ideas. In 1941, he commissioned an idea for $5,000 from Orson Welles about French bluebeard Henri Désiré Landru, who was executed in 1922 for his murders of 10 women, one boy and two dogs. Another project was an adaptation of the Paul Vincent Carroll stageplay Shadow and Substance. Joan Barry, ironically enough, was set to play the lead in this film and went through a series of screen tests and other arrangements to prepare her for the part. However, once they had a falling out and the messiness of the paternity suit came forward, Chaplin shelved Shadow and Substance indefinitely. A full script was produced and is still in the Chaplin Archives in Switzerland, but Chaplin never got around to completing the picture. This left him with his Landru script, which took him nearly four years to finish the screenplay. The film, in the end, was titled Monsieur Verdoux. 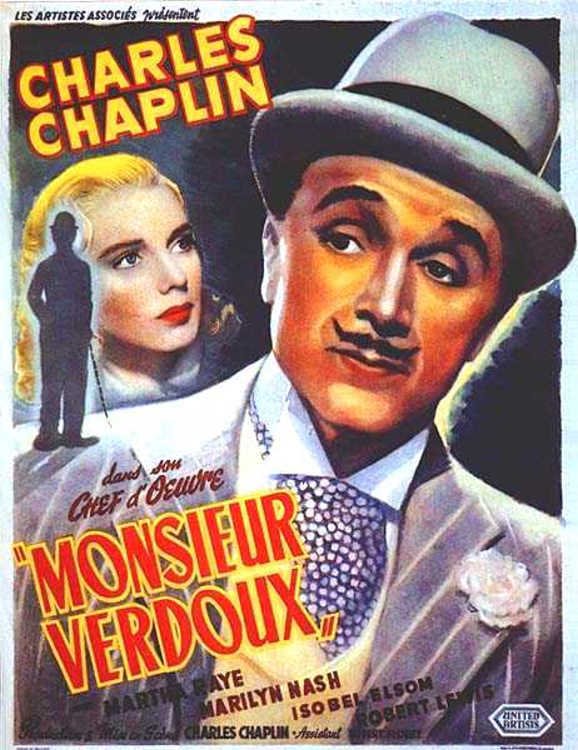 Chaplin plays Verdoux, a bluebeard who murders rich widows and invests in their fortunes. As a front, he has a furniture business that is in most regards inoperative. Furthermore, at a county cottage, he has a son and his true wife that he loves, who is an invalid. Both of them only see the kind, loving husband and father and never know of how he makes his living other than the furniture front. One day he meets a beautiful young woman (Marilyn Nash), who is down on her luck and having to work as a prostitute. He lures her in at first to test a new poison, but then finds he cannot follow through and tries to persuade her that life is worth living. Many years later, he runs into the woman after he is down on his luck and lost everything in the stock market crash and she is a wealthy socialite. Soon after, his past comes back to haunt him and he is arrested for his murderous deeds and sentenced to death. In the end, Verdoux asks the judge and the audience if he is really the worst of them, a man trying to help his family through the best means he could muster, or are the weapons of mass destruction and other terrors out in the world much worse. A biting satire with strong social criticism and certainly Chaplin’s darkest comedy, Chaplin himself considered this the cleverest film he had ever written. 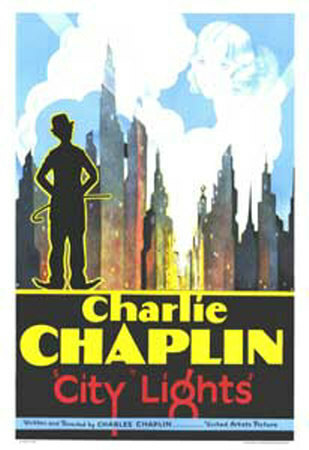 Upon release in 1947, it was met with mixed reviews and many interviewers questioned Chaplin’s supposed radical views and political ideals rather than ask questions about the film. Several critics, however, did give raving reviews of the film and it was nominated for a Best Original Screenplay Academy Award. In recent years, the film has become somewhat of a cult classic, even amongst non-Chaplin enthusiasts. These vicious attacks during the McCarthy era communist witch hunts and constant pursuit by the U.S. government would eventually be what drove Chaplin away from the United States in 1952, after calling it home for nearly 40 years.